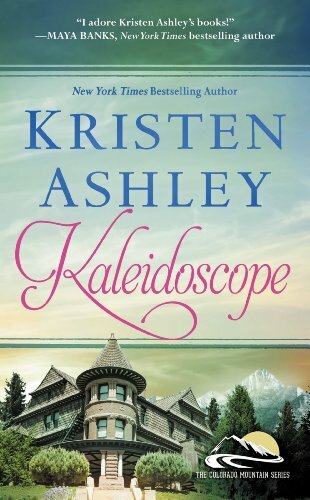 Kaleidoscope is the sixth book in Kristen Ashley’s Colorado Mountain series. These titles are more emotional and less slapstick than Ashley’s bestselling Rock Chick series. They do, however, feature the same waffle-weave-wearing, bossy mountain alpha men that her fans have come to expect. Readers met successful P.I. Jacob Decker earlier in the series. But his heroine, Emmanuelle “Emme” Holmes is a new character for the reader, if not for Jacob. Kaleidoscope is an old-friends-to-lovers story. Several years before the book opens, Emme was a close friend of Jacob’s ex-girlfriend. When the ex dumped him, he lost both his girl and Emme as a friend. To Jacob’s delighted surprise, he and Emme now live in the same town. Unfortunately, she’s dating a jerk—one implicated in a case Jacob has been called in to solve. Kaleidoscope is classic Kristen Ashley. With over 30 novels, the author has carved out her very own subgenre of romance. Each book is an intensely emotional, voicey journey in which even the smallest details of her characters’ lives serve to paint the greater picture. Ashley, or “K. A.” as her uberfans call her, crafts tightly imagined personal landscapes for each couple she creates. Some readers may be put off by the avalanche of workaday details. By the last page of Kaleidoscope readers will be intimately familiar with the floorplan of Emme’s sprawling money pit of a house and the color scheme of Jacob’s bed linens. But in Ashley’s world, knowing what a man likes on his baked potato or whether he changes the oil in his own truck is part of loving him. In less talented hands the endless detail could be catastrophic to the storytelling. But Ashley renders these trifles in a chatty, congenial style as if they were overheard during the coffee hour after church. To read Ashley is to feel as though you were seated at her table for a bridge game or charity event. All the world’s problems are solved twice before it’s time to leave, and both laughter and copious tears are part of the journey. Ashley’s heroes are another of her calling cards. Jacob is cut from the same strong, silent cloth. But like her other men, Jacob has the ability to articulate his feelings when it most counts. That’s the recipe that has hooked so many readers. And so what if none of her mountain men ever bother to pronounce the last syllable of their words? The Kristen Ashley Addict’s Support Group on Goodreads boasts over 6,500 members, with long discussion threads for each of her books. The plot of Kaleidoscope features fewer suspenseful twists than some of the other Colorado Mountain books. And fans will not be shocked to find that two kidnappings figure into the plot. (Ashley’s novels always feature a kidnapping. Always.) But this time Ms. Ashley has chosen to subvert her own favorite plot device. In a genre where the bad guys are always unequivocally bad, this book features a kidnapper whose moral territory is grayer than the reader is accustomed to finding. Likewise, the book’s second kidnapping plot twist is also not quite what it seems. Readers are unlikely to miss the suspense, however. And that’s because Ashley has always understood that the emotional work of a novel doesn’t really happen at the wrong end of a gun, but instead happens afterward, when the hero and heroine conduct a post mortem on the violent test of their courage. Kaleidoscope is another solid entry into the K. A. repertoire, even if it’s a bit quieter and more reflective than previous books. Her fans will not be disappointed.